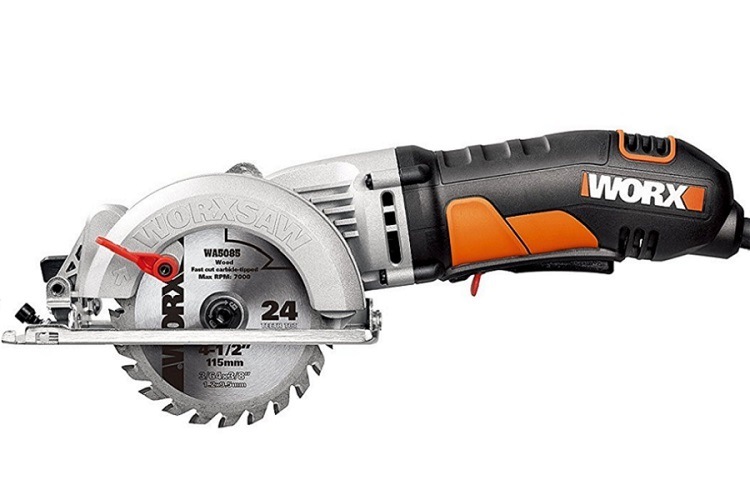 The Worx WX429L is a great example as to why I like compact circular saws so much. Not only is it one of the most affordable saws on the market, it’s surprisingly powerful, versatile, and easy to use, for pretty much anyone. For whatever reason, I have a soft spot for compact circular saws. No, they can’t handle large cutting tasks like a full-sized 7 ¼ inch circular saw, but if you need some smaller cutting jobs done, they are hard to beat. This can include any number of things, ranging from some basic 2x4’s, to cutting some sheets of particle board for your kid’s treehouse. Piping and smaller metal materials can often be handled by these as well. You can probably see where the advantage is. I love my standard circular saws, but it’s always fun to bring out the smaller cousin when you have a smaller job to do. The Worx WX429L is a great example as to why I like compact circular saws so much, not only is it one of the most affordable saws on the market, it’s surprisingly powerful, versatile, and easy to use, for pretty much anyone. The WX429L is small, but there are plenty of things to highlight. The heart of the saw resides with the 4 amp motor. This motor is actually a little less powerful than what you’ll see for this size, but it uses the power more efficiently, so you won’t notice a drop off between this and other similar models. In terms of handling, the WX429L really shines. This is due to an even weight distribution, but also a soft grip that uses an integrated safety switch that is quite easy to reach when activating the trigger. A left-sided blade view gives you a clearer angle to actually see what you’re doing as you cut. Getting perfectly straight cuts can be tricky at times when using a compact saw, so Worx included a very handy parallel guide attachment you can use to keep the saw inline. This is a very smart idea that other compact saws should follow. The saw’s depth gauge lever is located right next to the blade, so all you need to do is reach over and over the switch anytime the depth needs to be changed. Takes about 1 second, and couldn't be any easier. The saw comes with an allen wrench for blade changes, and you can actually store the allen wrench right on the saw’s cord so you don’t lose it. Some compact saws don’t come with a blade standard, but the WX429L includes a 24T carbide-tipped blade with a thin kerf, letting you cut materials with less strain and overall heat. The saw also comes with a vacuum adapter for dust removal and a generous 3-year warranty. The main thing to appreciate about the WX429L is its superior handling. It weighs 5 lbs and has a smart grip design that makes it very comfy to hold, and the safety trigger switch is in an ideal location that won’t strain your hand. The included blade is actually pretty good, and while some may want to eventually upgrade (or change the blade for other materials) you can certainly get by with the included 24T carbide-tipped blade. The parallel guide attachment is a major help. As I said earlier, compact saws can be jumpy and wiggle, so this guide attachment completely eliminates that, and ensures a perfect cut, as long as the outside edge of the material is parallel. The dust port is way more functional than other models as well, and doesn’t include the usual flimsy dust bag that barely works. The 4 amp motor performs above its capacity, but you still might encounter some difficulty with harder, heavier materials. Be prepared to saw a little slower, and with more force. Standard material is fine, however. The small width of the sled actually has some pros and cons. The smaller size lets you deal with smaller materials when making freehand cuts in tight situations, but it also means that it could slip due to the lack of base, which could end up cutting at an angle. It’s a give or take kind of thing. The rip fence does have a flimsy plastic section that flexes a little, and the screw mechanism can be a bit difficult to deal with. You’ll get the hang of it eventually, but it can be annoying at first. As long as you know the limits of a compact saw, you shouldn’t have any issues with it, and this includes professionals who need saws that can handle the rigors of a job site. Compact saws are for smaller cutting jobs, so when you stay within that range, they can be practical for anyone. 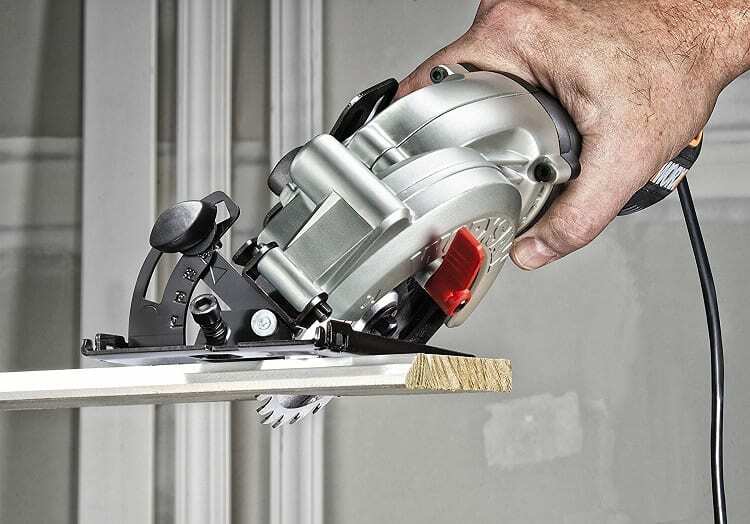 I’m willing to bet that seasoned contractors and builders can get plenty of use out of a saw like the WX429L, especially when needing to trim thin boards, wayward studs, excess PVC piping, and more. If you’re needing a versatile saw to use around the house, and for small home projects, it’s hard to go wrong with the WX429L’s price and capabilities. The Worx WX429L does everything a compact circular saw needs to do. It’s light, very easy to operate and maneuver, and it provides unmatched versatility for any number of different situations -- as long as you’re using it for the right size of the material. This saw has a lot going for it beyond the low price, but I imagine the low price is what will draw many to it. While this usually isn’t a good thing, in this case, it actually is. The Worx WX429L is simply the best circular saw for under $75 on the market, and you’ll be surprised as to what it can handle.